Tate & Lyle sugar sold in shops is to be Fairtrade accredited, making it the biggest UK firm to carry the label. Granulated white cane sugar will be the brand's first Fairtrade product but it says it expects its entire retail range to follow by the end of 2009. To earn a Fairtrade label, firms must pay local producers a fair price, and invest further to improve working conditions and local sustainability. The firm says it will add £60m to the value of Fairtrade sugar inside a year. Fairtrade Foundation executive director Harriet Lamb said: "In terms of size and scale, this is the biggest ever Fairtrade switch by a UK company and it's tremendous this iconic UK brand is backing Fairtrade." The first Tate & Lyle sugar to be given the accreditation comes from Belize, where the company has been trading for 35 years. Carlos Magana from the Belize Sugar Cane Farmers Association told BBC News 24 that the link-up with Tate & Lyle would not just benefit farmers. "It will enhance education, health and other community projects," he said. 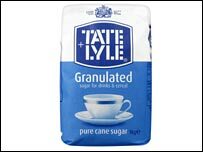 Sales and marketing director for Tate & Lyle, Steven Hermiston said: "Now, every time you buy a pack of Tate & Lyle Fairtrade cane sugar farming communities will benefit." The switch to Fairtrade affects the firm's packs of sugar sold in shops. The cane sugar Tate & Lyle provides to manufacturers is not yet included in the Fairtrade conversion plan. The company said there are "long-term ambitions" to include its industrial supplies, although the move would be dependant on partnerships with its customers. Fairtrade labelling was created in the Netherlands in the late 1980s. Producers must be paid a minimum price to cover the cost of sustainable production plus an extra premium to be invested community development projects for Fairtrade status to be granted. Tate & Lyle's move coincides with Fairtrade Fortnight in the UK from 25 February to 11 March which aims to raise awareness. There has been an increase in the number of UK retailers stocking Fairtrade products, such as bananas, coffee and flowers, including Tesco, Sainsbury and Marks & Spencer.